Get the most out of GoingOut by connecting with Facebook. Or continue using GoingOut with limited features. Since opening in 1994, The Barking Crab has hosted thousands of fun events! Whether you’re looking to put together your company office event, cocktail party, planning a casual rehearsal dinner, wedding reception, divorce celebration, birthday parties, citizenship fetes, celebrating a big win, soothing a loss, we’ve hosted them all and look forward taking care of all your event needs. Whether it’s a large cocktail party or a group of 10 guests, our unique set up with high top tables or oversized, rustic picnic tables can entertain all groups! Impress everyone in your group by treating them to the ultimate New England experience at The Barking Crab! To find our more information on hosting your event, please fill out the information below and someone from our events team will be in contact shortly! Gratuity/Tax: 20% suggested, 7% sales tax, 3% admin fee apply to all private events. Final Payment: We do require credit card information to hold the space and book your event, but the card will not be charged ahead of time, your event is paid in full on the day of your event! Menu Selections: Sit down dinner, Raw Bar Options, Reception Style Events, New England Clam Bakes and more! 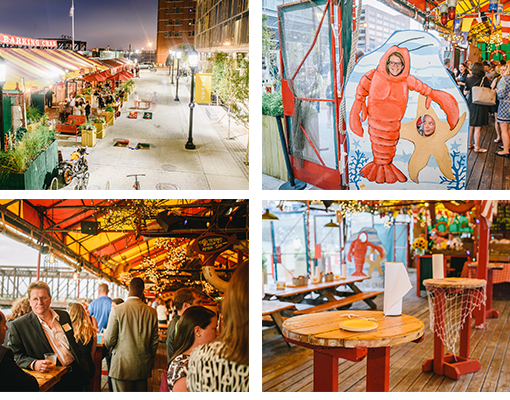 Decorations: The Barking Crab will provide its own decorations to fit the image of our venue. Clients who book with Barking Crab will be welcome to bring in any other decorations as long as it fits within our guidelines. Rent Entire Venue: Available: Outside covered deck, Inside Dining Room, Outdoor Patio! Parking: Street parking for the lucky and several area lots and garages. TVs: Small TVs to keep an eye on the world outside. Water View: Located in Fort Point, South Boston!